Diamond Cut: This diamond cut guide will explain everything there is to know about diamond cut. Diamond cut refers to how well a diamond is cut. 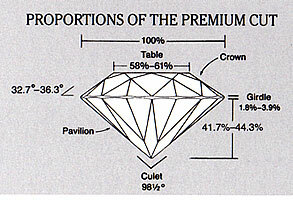 Different shaped diamonds have different diamond cut specifications. Diamonds come in many shapes: Round Brilliant, Princess, Marquise, Emerald, Radiant, Oval, Pear, Trilliant and Heart Shaped. But, That is not what we mean when we say diamond Cut. 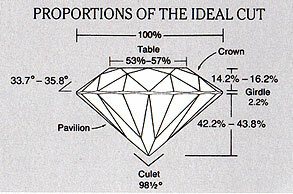 The Cut of a diamond refers to the proportions of the diamond based on the quality of the job that the cutter did. Cut has nothing to do with Polish , Symmetry or Fluorescence or the quality of the rough. The Better the proportions of a diamond are the more Fire, Sparkle, Scintillation, and Brilliance it will have. This also directly affects the price of the diamond. There is also another train of thought that believes that the perfect diamond has a 60-60 make. This means that the depth should be as close to 60% as possible with a few degrees varience either way and the table should be as close to 60% with a couple of degrees varience either way being acceptable. If you stay within these parameters, you should end up with a very beautiful diamond. You can stray one or two degrees outside of these parameters, but the farther away from ideal you go, the more it starts to affect the beauty of the diamond. Below is a diagram of what happens when a diamond is out of shape. If the diamond is too deep or two shallow, the light will leak out of the diamond through the bottom instead of shining brightly back up into your eyes. The Diamond at the top is an Ideal Cut Diamond and almost all of the light is reflecting back up just as it should. The Diamond in the middle is way too deep and the light is leaking through the sides and bottom. Instead of reflecting back up. The diamond will look dark instead of bright and shiny. A diamond this deep is called a Nailhead. The Diamond on the bottom is way too shallow and the light is going right through the diamond and out the bottom. The Diamond will appear watery, glassy and dark. A diamond that is this shallow is called a Fish Eye. A shallow diamond is preferrable to a deep diamond simply because it looks bigger. Anything outside of these proportions is called an off make. Preferred Proportions for Fancy Shaped Diamonds: Since the round brilliant cut diamond is the only shape that is optimized for brilliance and sparkle, there is no ideal cut proportions for fancy shapes. If you wander outside of these parameters, it will not have as pronounced of an affect on the diamond as it would with a round diamond. Note on Girdle: It is acceptable for a girdle thickness to range from extremely thin to extremely thick as long as it is Ex Thn - Ex Thk. You DO NOT just want want Ex Thn all the way around or Ex Thk all the way around. If it is extremely thin all the way around the diamond, it may chip while being set. If it is Extremely thick all the way around, the whole diamond will appear smaller in diameter because it will hide too much weight in the girdle. An extremely thick girdle on a diamond can also be difficult to set. Note on Polish & Symmetry: It is very rare to find excellent polish and excellent symmetry in a fancy shape diamond and since the difference cannot be seen without 10X magnification and a very trained eye, it is very acceptable to go with Good or better. Note on quality of rough: While it is possible, with a round brilliant cut diamond, to squeeze a small percentage more sparkle and/or brilliance out of the diamond by optimizing the diamond cut, the quality of rough is what determines over 80% of the actual performance of the diamond.